Cheeky Tots is a friendly family run business that is based in Essex. I am a mum of two small children and we spend a lot of time visiting different soft play venues. Young children love soft play, it’s an important part of developing their social skills and co-ordination in play. But big soft play areas can be very scary places for parents and children. Without the worry you can sit and relax and watch your child play with the knowledge that they are safe and having plenty of fun. 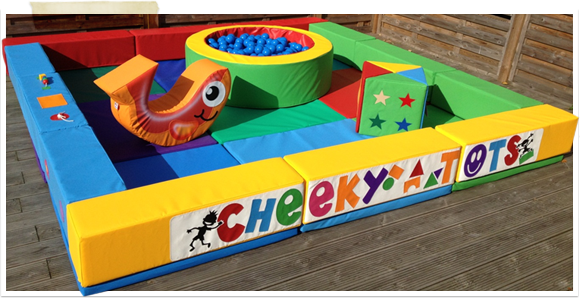 Cheeky Tots brings the soft play to you for any type of party or event – Birthdays, Christenings, Weddings, Bar mitzvah’s, bbq’s, even coffee morning’s. Anywhere there are little ones that need entertaining. We can come to any type of venue be it at home or a hall, indoors or outdoors. For 0 to 6 year olds, we provide professional soft play equipment in specially designed in fully matted areas. The matted areas are 3m x 3m with either a kerb wall or without. We deliver, set up and then collection after. We deliver free within a 10 mile radius then after that a small deliver charge will apply. Please feel free to take a look at our different packages available. We can also arrange for any bespoke requirements with our pick and mix selection. There are also a number of added extras that can be incorporated into any package for a more varied design.